The Kimi boots come in an assortment of colors (charcoal, coffee and black) and are super cute and warm, great to slip over a pair of leggings. Made out of studded suede, these boots have a cozy wool and acrylic interior that will keep your feet warm when you don't have them propped up by the fire. Lugz has many other styles as well in mens, womens and kids sizes! Follow Lugz on Facebook to get the latest updates. One lucky reader will win a pair of Kimi boots in their choice of color and size. This giveaway is open to U.S. residents and will end on January 11th at 11:59 p.m. EST. Please enter on the form below. a Rafflecopter giveaway Disclosure: Participating blogs are not responsible for prize fulfillment. Winner will be verified and have 48 hours to claim prize. If you have any issues with this giveaway form please contact Kara's Deals & Stealsat karabearblu@gmail.com. What is the one thing a new mother never leaves home without? A diaper bag of course! EquiptBaby offers the best in diaper bags for you to have on hand. Whether you are using it for daily trips to the store or to visit a friend, or you are packing it for an extended stay away from home this diaper bag is the ultimate. Baby fashion meets functionality in a deluxe diaper bag with multiple offerings to make a new moms life easier. • Secured outside pocket for keys, etc. Have you ever been out and about with your baby and simply needed a safe and comfy place to lay them down for a quick nap? EquiptBaby gives you not only a place to carry diapers, change of clothing and food – it gives you a built in easy to use collapsible bassinet. This lined and easy to assemble bassinet is great for those quick naps at a friend’s house. New moms everywhere will love how durable this diaper bag is. Sturdy detachable straps make it easy on shoulders when you are carrying a lot in the bag. A wider opening and flexible bag means you can fit even more in this EquiptBaby bag than a traditional diaper bag. It totally meets fashion and functionality in one item. Store snacks, water, formula or even breast milk safely in the insulated storage pocket inside. No need to carry a separate cooler for this bag. Simply unzip and slide your chilled items inside. This provides a measure of convenience and protection that every new mom will love. Whether you are buying for yourself or a friend, the EquiptBaby diaper bag is a great choice for any new mom. With classic gender neutral colors it is easy for mom and dad both to carry without it being too showy. The black bag is perfect with any outfit, and matches every baby bedding theme. Don't hesitate to invest in this great diaper bag for your favorite expectant or new mom this year. One lucky winner will receive an EquiptBaby Complete (RV $149.90). Giveaway ends January 6th at 11:59pm, open to US residents, ages 18+. To enter please use the Rafflecopter form below. Good luck. Today, I want to introduce you to a must-have product that actually grows and changes with your child. The SmarTrike Boutique Touch Steering 4-in-1 Trike offers a fun outdoor experience for kids between the ages of about 10 months and 3 years. Of course this will depend on the size of your child. Sophie and Xander are very small for their ages, so at about 4 and 5, they are able to ride this trike just beautifully. Exciting News! I'm a Peppa Pig Parent! Airing daily on Nick Jr., Peppa Pig follows the adventures of Peppa, a loveable, exuberant little piggy who lives with her brother George, Mummy Pig and Daddy Pig. Peppa’s favorite things include playing games, dressing up, spending days outdoors, and jumping in muddy puddles. All episodes are wholesome entertainment for the entire family; Peppa’s adventures always end happily with loud snorts of laughter. Purchase between now and January 20th, follow@BuyDig, tweet your order number and a brief description of your purchase, include the hash tag #DigMyOrder, andcom will automatically enter you in a weekly contest to receive a full refund on your order of up to $500.00. Enter the Giveaway Tool below. Ring in the new year with some fun from Little Tikes! Enter to win 1 of their 2 newest toys, either a Big Dog Truck Ride-On and Walker OR a Lalaloopsy Babies Diaper Surprise Doll! 2 lucky winners will win their choice! How adorable are these toys?! Sophie and Xander might be a bit big for the Big Dog Truck, but I know they'd flip over the Lalaloopsy doll! Especially since it poops. For some reason, kids seem to find poop very amusing! What's more fun then starting the new year with new toys! 2 lucky winners will win their choice of either a Big Dog Truck or Lalaloopsy Diaper Surprise Doll! 1 winner for each toy. Toddler ride on and walker with 4 modes of play: Push walker, wagon, ride-on, and dump truck! Light bar, nose and handle have sound effects for enhanced interactivity! Enter through the widget below. Giveaway ends 12/30. Open to US residents 18+. Today, I would love to talk about bling. You know, things that sparkle, shine, and make a woman feel beautiful. With the Holidays upon us, many are trying to find the perfect gifts for the special ladies in their lives. Whether she's young or old, jewelry is always a safe bet. You might even get an extra kiss or two under the mistle-toe! I do realize that jewelry can be expensive. Not everyone can afford to run to their nearest high end jeweler and drop hundreds or even thousands of dollars on diamonds and rubies and the like. (I know WE can't, at least!) Did you know that there are equally beautiful, less expensive handmade options out there? That's right...I said handmade. Trust me, men out there. Chicks dig handmade items. They're much more personal than mass produced goods. One of my favorite places to get unique, gorgeous handmade jewelry is South Paw Studios. This up-and-coming studio is actually located here in my home state of Ohio, and wonderful things are made here in the Buckeye State. Just look at LeBron...Or me. Haha. Anyway, South Paw Studios offers some stunning necklaces, earrings, and bracelets that are sure to please any lady on your gift list this year. The Holidays are upon us! You all know what that means! Presents being unwrapped, smiling, happy faces of family and friends, and loads and loads of delicious food. (The food is probably my favorite part of the Holiday season!) But with all the Holiday feasting comes gas. You know...Tummy troubles. Cramping, bloating, and maybe even a mad dash to the restroom or three. Some foods, while absolutely amazing, can definitely create a lot of chaos internally. For me, the triggers seem to be spicy foods and even leafy greens. For some reason, as I have gotten older, my body simply doesn't digest certain foods as easily as it did in my younger years. Now, I have to think twice before reaching for certain dishes, like my almost-famous Stuffed Pepper Stew. This makes me sad, because my Stuffed Pepper Stew is absolutely amazing. Thankfully, this Holiday season I have a secret weapon on my side. The embarrassing, uncomfortable gas will be a thing of the past thanks to CharcoCaps® Anti-Gas Formula. 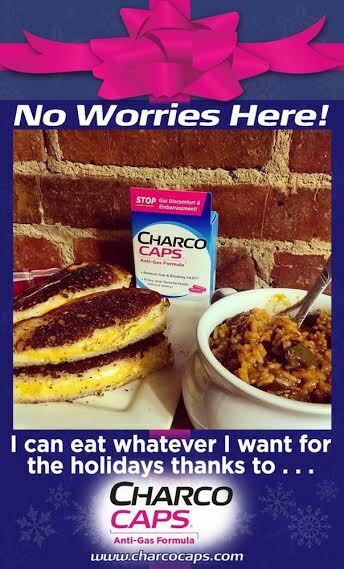 CharcoCaps® are made from activated charcoal, an ingredient commonly used by hospitals to treat accidental poisonings. Of course CharcoCaps® Anti-Gas Formula​, being an OTC product, are not meant to treat poisonings. They can, however, allow you to eat all of your favorite foods without the worry of bloating or embarrassing gas! Oh, and they're completely safe, and provide gentle relief of all those annoying symptoms. Did you know that just ONE teaspoon of activated charcoal has the surface area of a football field? This is all thanks to its amazing absorption properties! 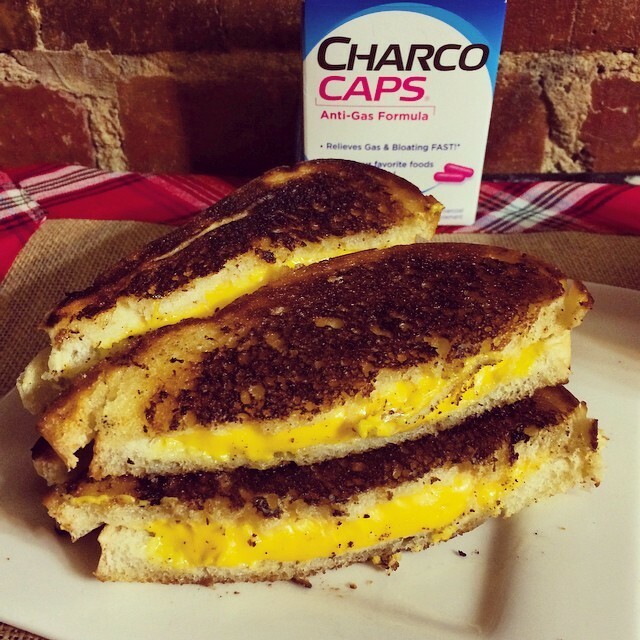 So when you find yourself surrounded by trigger foods, simply take 2 CharcoCaps® and eat away. You can repeat every 2 hours as necessary, but do not exceed 16 capsules per day. I have had the pleasure of putting CharcoCaps® Anti-Gas Formula to the test, and I have to say, I am definitely impressed. Recently, I made a couple of my favorite foods for dinner. We had my Secret-Ingredient Diner Style Grilled Cheese and my Stuffed Pepper Stew. These are foods that would normally cause me some digestive issues. Okay, who am I kidding? This combination of foods would usually cause me to stink my family out of the room thanks to the gas they produce. Hey, just keeping it real here, folks. I have no shame. I am a woman, and I fart. My ex-husband used to say that classy women don't fart, but that's a different post entirely. 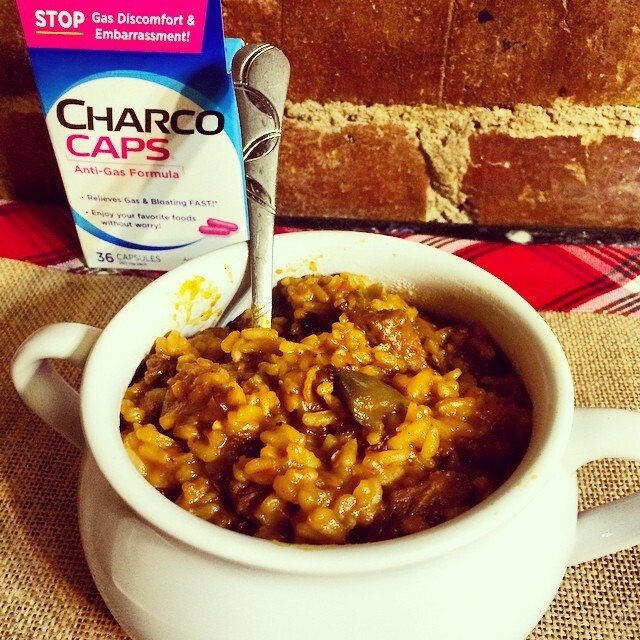 I have been taking CharcoCaps® before eating my trigger foods, and I have definitely noticed that my "tummy troubles" have lessened considerably. 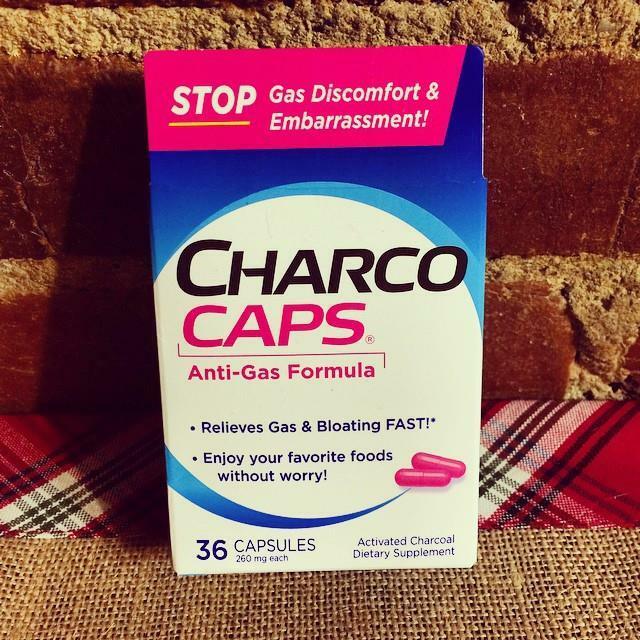 I have not experienced the typical cramping, bloating, or nasty, odiferous gas while using CharcoCaps®. For this, I am very grateful, and I am sure my family is, too! 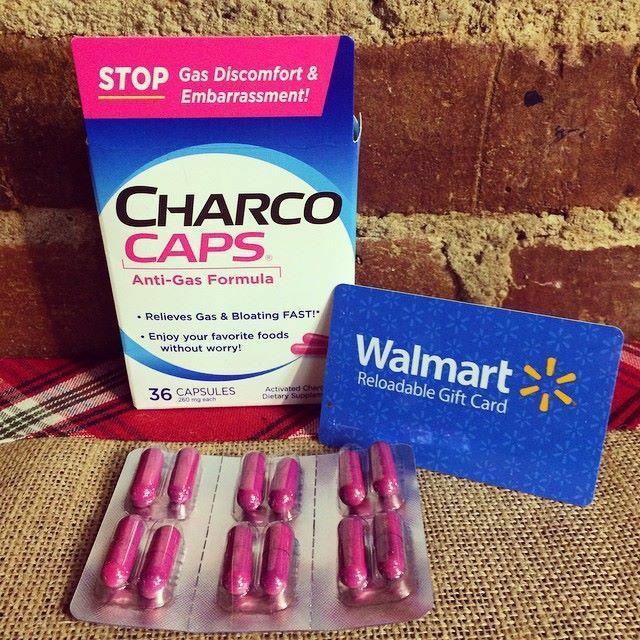 CharcoCaps® Anti-Gas Formula is available at Walmart, CVS, Walgreens and other US retailers nationwide in both 36-count blister packs and 100 count bottles. Suggested retail cost for a 36-count blister pack is $9.49. Definitely a small price to pay for some major relief, don't you agree? For more information, please visit the CharcoCaps website.